Although, since hers was a case of martyrdom, no miracle was required for her Beatification, a miracle is absolutely necessary for the canonical declaration concerning her sainthood that we are all waiting for. For this, let us place our trust in the Lord that he will give heed to the prayers that his faithful offer through the intercession of Blessed Maria Guadalupe and grant the miracle needed so that her canonisation may come speedily. All the graces and favours granted through the intercession of Blessed Maria Guadalupe are appended to her Cause, so the Postulation would like to thank all those who send in a faithful account of the graces they have sought and obtained. 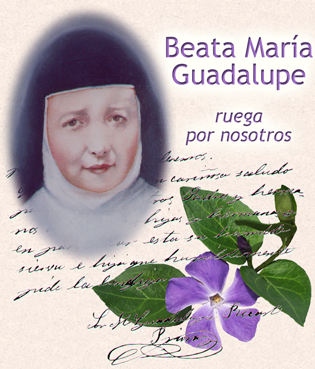 The Postulation also wants to thank all those who through their offerings make possible this web page and the printing of holy cards and leaflets to spread devotion to this Martyr and broadcast the message of her wonderful witness of love for Christ and his Sorrowful Mother. We need your collaboration a lot.